Being a huge lover of cheesecake I wanted to share with you my mini white chocolate mint cheesecake recipe. I made these over the holiday and pretty much do every year if I have the time. I have been known to make several different flavors and package them up and give away as Christmas gifts. My kids, husband and everyone that eats them just loves them. They are always a huge hit for dinner parties and they do make great Christmas gifts. You will need 1 – 24 count mini muffin/cupcake tin (Wilton Recipe Right 24 Cup Mini Muffin Pan ) and 24 mini foil baking liners (Wilton 415-2624 100 Count Christmas Sparkle and Cheer Baking Cups, Mini ). Preheat oven to 350 degrees F (175 degrees C). Line mini muffin/cupcake tins with mini foil baking liners. Mix chocolate wafer cookie crumbs, sugar and butter in bowl. Spoon a teaspoon of crust mixture into each liner and mixture firmly down into the bottom of each liner. Bake in oven for 10 minutes. Remove pan from oven. In a mixing bowl, beat cream cheese, sugar, egg, lemon juice, vanilla extract, melted white chocolate, and peppermint chips until smooth and silky. Fill each mini liner with mixture on top of the crust, almost completely to the top. Bake in oven for 12-15. Cool before serving. 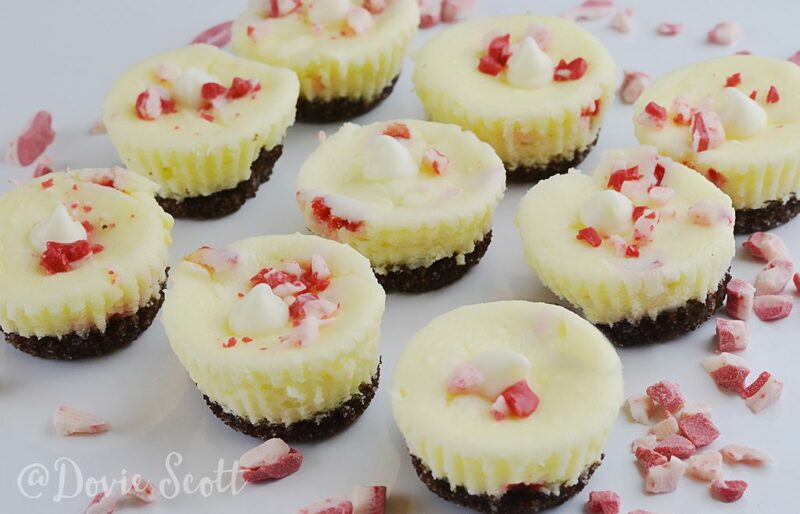 Store cheesecakes in refrigerator or freeze. If you freeze then thaw completely before serving. Tips: Make sure your cold ingredients are at room temperature before you start. Remove cheesecakes from oven before they crack, when the center is still soft.